A photo of SCP-2707 in containment. Special Containment Procedures: SCP-2707 is contained in a cage of approximately 200 cm in height and 80 cm in length and width. The cage is decorated from a variety of tree branches from its native habitat in South Asia as well as various rocks and recreational equipment. Its water dispenser and food dish are to be changed daily. The containment is to be cleaned once a week. Agents and Researchers passing its containment area are allowed to speak to it in order to help socialize it. SCP-2707 is to have weekly meetings with the on-site psychologist to record and maintain its socialization progress. SCP-2707 is also to be examined by the on-site veterinarian bi-annually. Physical contact with SCP-2707 is prohibited. No text messages, calls, letters or similar messages may be written within 5 meters of SCP-2707. SCP-2707 is known to repeat any words it has been provided frequently, presumably in an attempt to send messages. These are to go ignored. 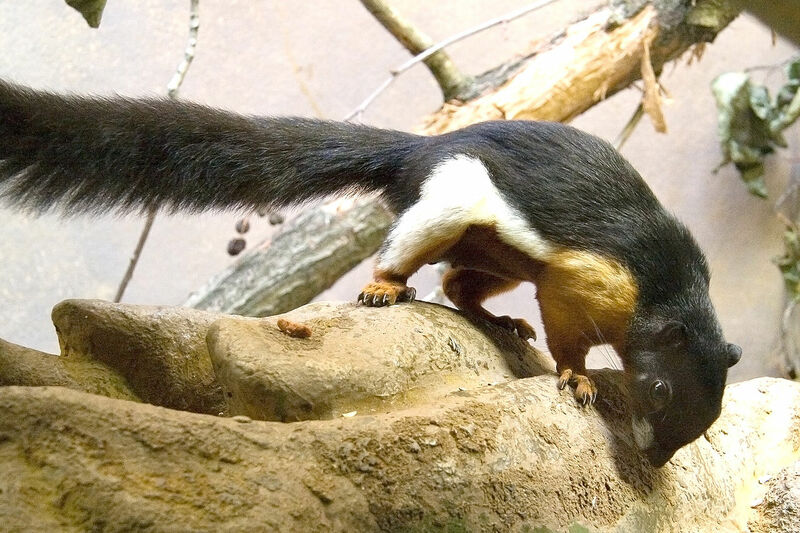 Description: SCP-2707 is a male specimen of Callosciurus prevostii (Prevost's squirrel or Asian tricolored squirrel) that is capable of speaking fluent Malay and disjointed English. It has expressed intelligence equivalent to a human in early childhood. SCP-2707 is capable of transmitting thoughts or messages through physical contact. However, it can only transmit thoughts from other individuals who touch it or messages that have occurred within 5 meters of it. A message in this case is defined as a series of words that have been written by one individual with the purpose of being received by another individual at some later point in time. It is currently undergoing socialization with humans in order to reduce its stress levels from lack of socialization with other squirrels. Notes: The interview is conducted entirely in Malay. Dr. Megat: Hello. What name would you prefer? SCP-2707: Anything is okay. A name that sounds impressive is good too. I want to be like my grandfather of many generations ago. Dr. Megat: Could you tell me more about your grandfather of many generations ago? SCP-2707: He was a strong and beautiful squirrel. He climbed a great tree and passed messages between very important people. I am his child and I will bear the same title someday. Dr. Megat: Does everyone in your family do what you do? SCP-2707: No, only those who can perform the holy message passing can use the title. I can do it so I will have the title too. It is scary but I am proud. Dr. Megat: What is the title? SCP-2707: Rata tos ker. (Note: This was not translated from Malay.) One who climbs the great tree. Dr. Megat: What if the great tree is not there anymore? SCP-2707: I don't understand. I can perform the act. So the tree must be there. Dr. Megat: Can you tell me where the tree is? SCP-2707: No. But I know it is there. Otherwise why was I born? Dr. Megat: Would you like to ask me anything before I finish? SCP-2707: [excitedly] Can I go home? Can you find the tree for me? I want to go to the tree. I want to make my mother happy I was born. Dr. Megat: I can't let you go home right now. I will ask my friends to help me find the tree. Be patient please.